Do you have cold hands and feet? Bio-Biloba by Pharma Nord improves circulation, keeping the body nourished with warm, oxygen-rich blood. This dietary supplement contains natural extracts of the Ginkgo biloba tree. For centuries, extract from the leaves of this tree has been used for therapeutic purposes. All Pharma Nord products have been developed based on scientific research and only contain carefully selected quality ingredients. The dietary supplements and herbal preparations by this brand are produced in Denmark according to the strictest local quality requirements. 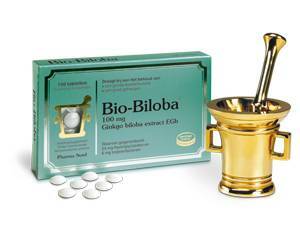 You can order Bio-Biloba online via a Dokteronline.com partner pharmacy. Bio-Biloba does not require a prescription. Bio-Biloba does not only benefit sufferers from cold hands and feet. This natural herbal remedy also helps improve memory and concentration. The leaves of the Asian Ginkgo biloba tree contain ginkgoflavone glycosides and terpene lactones. These ingredients promote circulation and provide the limbs as well as the brain with nutrition and oxygen, which has a beneficial effect on body and brain functions. Because Bio-Biloba increases blood flow to bodily tissues, it is also helpful against cold hands, feet and heavy, tired legs. When taken daily, it is possible to achieve the desired effect in approximately four to six weeks. You can order Bio-Biloba online from our partner pharmacy. Bio-Biloba is available in various size packs. The recommended dose is one tablet a day. It is best to take Bio-Biloba with or directly after meals. The tablets should not be chewed, but swallowed whole with some water. Read the package leaflet or instructions on the package before use. Bio-Biloba tablets are suitable for vegetarians and vegans. They are also halal and kosher. Bio-Biloba tablets by Pharma Nord have no side effects. If you do experience side effects, consult a doctor. Do not use if you are allergic to any of the ingredients in Bio-Biloba (see the package leaflet or information on the package). Do not use if you are having surgery in the near future as improving circulation can increase the risk of haemorrhaging. Bio-Biloba should not be used by pregnant or breastfeeding women without consulting a doctor first. This dietary supplement is not suitable for children, unless the doctor instructs otherwise.